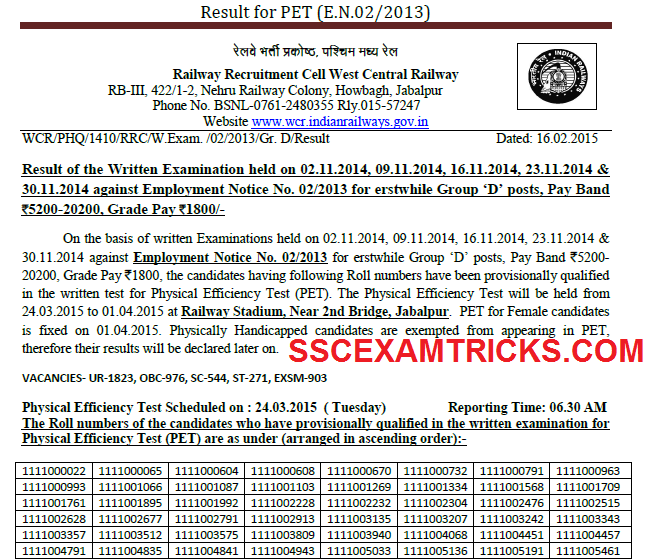 Railway Recruitment Cell (RRC), Jabalpur has released Physical Efficiency Schedule on 16th February 2015 of the shortlisted candidates which is going to be held from 24th March 2015 to 01st April 2015 at Railway Stadium, Near 2nd Bridge, Jabalpur. RRC Jabalpur is going to released call letters for this PET Schedule of candidates. A huge numbers of candidates had qualified in written examination. Earlier RRC had invited application against recruitment notification advertisement no. 01/2013 for 4517 vacant posts of Group D for Northern Region Group D. RRC had conducted written examination on 2nd, 9th, 16th, 23rd & 30th November 2014. A huge number of candidates had appeared in the written exam. PET for Female candidates is fixed on 01.04.2015. Physically Handicapped candidates are exempted from appearing in PET, therefore their results will be declared later on. Those candidates who had qualified in RRC Exam 2014 and waiting for PET Call Letters / Admit Cards can get their Admit cards/ Call letters from the direct link provided in the end of post. · They must be in good mental and bodily health and free from any physical defect likely to interfere with the efficient performance of the duties.